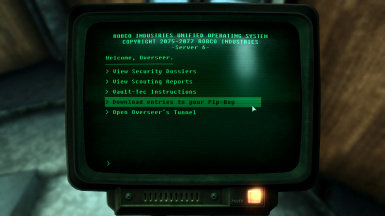 This simple mod adds the option to download all the notes on the Overseer's terminal to your Pip-Boy. You have a portable computer on your wrist. Are you really going to stop right there to read some notes while people are chasing you to kill you? This mod adds the simple and logical option to download all the information from the Overseer's terminal to your Pip-Boy during the quest "Escape!" so you can read it LATER. It makes no sense from a realistic point of view that you just stop to read all those notes while people are chasing you to kill you. This mod will also add the download option to other quests where you are in imminent danger but you need to get info from terminals quickly. So far, the Escape! one was the only one that comes to mind but suggestions are welcomed. Drop the esp to your Data folder and you're good to go. To Bethesda and this community for creating the game and enhancing it.